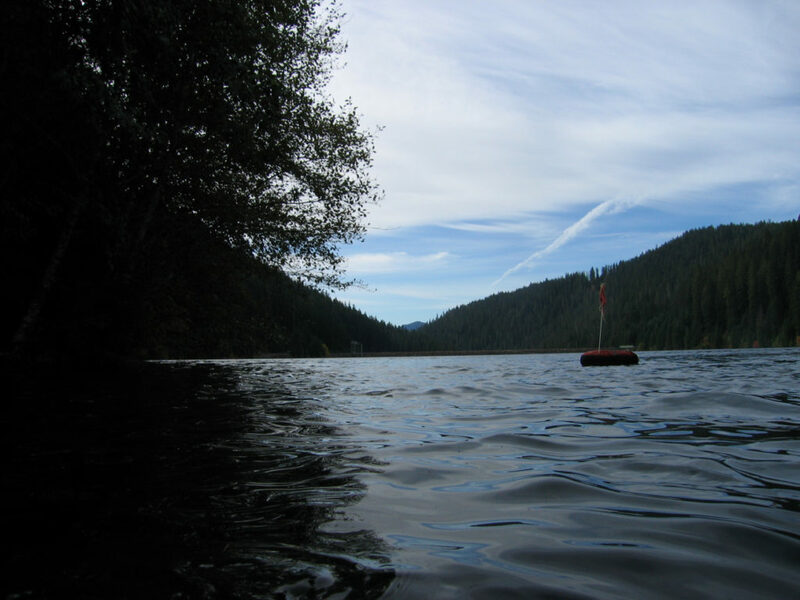 The upper car turnaround at Smith Reservoir is a good place to go if you want underwater terrain that is a little less steep than near the dam on Smith Reservoir. At this site you will see big algae mats near the surface and big stumps all over the place underwater. It’s common to see trout cruising by here, too. Looking toward the dam on Smith Reservoir from the upper car turn-around dive site. This lake does get boat traffic occasionally so a dive flag is a good idea. The main highlight on this site is the big underwater stumps. Old growth trees were cut down to make way for Smith Reservoir. The stumps are big and plentiful as you go down the underwater slope. This is also a good place to practice your diving skills at a little more forgiving of a site than somewhere like Clear Lake. The walk from where you can park your car down to the water is somewhat challenging and can give good practice for doing more demanding entrances on the Oregon coast. There aren’t any towns out here. The nearest humans will probably be at the lodge at Clear Lake. Otherwise Bend, Eugene, and Salem are all about the same distances away. You need to be self sufficient at Smith Reservoir. Watch for the signs for NF-730, Tamolitch Trailhead, Smith Reservoir, and Trail Bridge Campground along the McKenzie River Highway. The turn comes up fast so give yourself plenty of time to slow down and make the turn. Once you cross the bridge, go left and drive past the big water turbine power generator. There is a payphone here that worked the last time we checked. There is no cell service here otherwise. You will drive past the top end of Trail Bridge Reservoir (there are several dive sites at Trail Bridge Reservoir) and then head up a canyon before climbing up the face of Smith Reservoir Dam. Keep driving along the east shore of the lake until you get to the dead-end and turn around. This is the dive site parking area. The turn around at the end of the road has some areas that you can park at. Be sure to not block the turn around so that other people can turn their vehicles around here. The last time we were here, there were no signs or other indications of having to pay to park but this could change. The turn around area at the end of the road above the dam at Smith Reservoir is big enough to turn a trailer around. The site is laid out on the compass points. North heads to the shallow headwaters of Smith Reservoir while south heads toward the Smith Reservoir Dam. West sends you to deep water and east sends you to shore and your car. There are several decent entrances and exits along the shore. You do have to take some big steps to get into the water which can be exacerbated by water level in the reservoir. This is a shore dive although you could throw a boat in this lake and practice your boat diving skills. We have never encountered any waves or current here. Occasionally someone puts in a kayak, canoe, or motorboat so be sure to fly a dive flag. We have a highly recommended dive flag on our Gear We Use page. Water can be pretty cold though during spring snow melt. We have found visibility to be between 5 and 20 feet depending on the time of year and how much runoff is coming into Smith Reservoir. The bottom can get stirred up so be sure to practice good neutral buoyancy skills. Normally you’ll find water in the 45-55F range depending on where in the water column you are. In the spring, it can be much colder due to snow melt. Summer and fall are ideal conditions. Once the snow starts to fall, this dive site is inaccessible. You can either stay shallow or go deeper here. We have been down to 60 feet at this site on Smith Reservoir but you can go significantly deeper if you head west and south. Watch your max depth and remember that this is an altitude dive. Open water divers can successfully dive here. However, this is an altitude dive site and you should have altitude diver training before you go diving here. The diving itself is easy. Getting down to the dive site from the parking lot is more challenging. 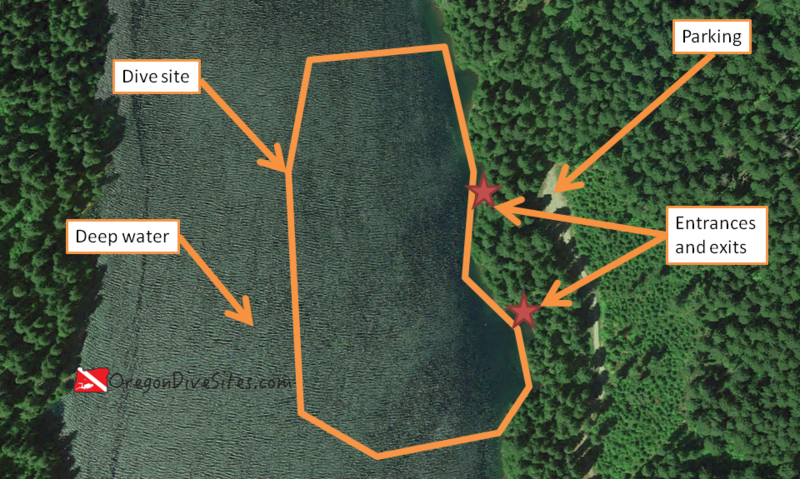 We rate this as a beginner skill level dive site but be aware that it is a bit challenging to walk down to the water. The other dive site at Smith Reservoir might be a better option if you don’t want a strenuous walk. 250 feet unless the water is really low. The water can be very clear in the right conditions at Smith Reservoir although usually the viz is around 15-20 feet. Remember that this is an altitude dive and you should have special training to dive at altitude. Stay well clear of the water intake structure near the Smith Reservoir dam. A flashlight (we have several we use and recommend on our Gear We Use page) is a good idea if you’re going deeper than about 30 feet. We had a regulator build up ice at depth at this site and free flow on us once. 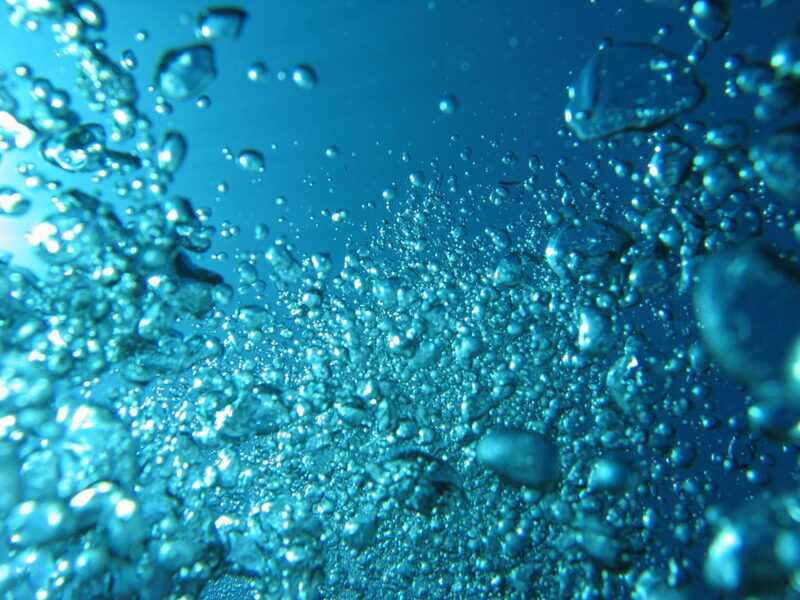 Because of the cold water and the depth you can achieve at the west and south parts of this dive site, there is the very real potential for a regulator free flow. There are no close dive shops up at Smith Reservoir. You need to be self sufficient. There are shops in Bend, Salem, and Eugene. The closest food of any kind is at the lodge at Clear Lake. The lodge at clear lake has some cabins for rent. Otherwise there is a campground at Trail Bridge Reservoir just down the hill from Smith Reservoir or there is plenty of primitive camping in the area.